This installment of Jennie Henderson’s Salt of the Turf is guest columned by Jeremy Henderson. 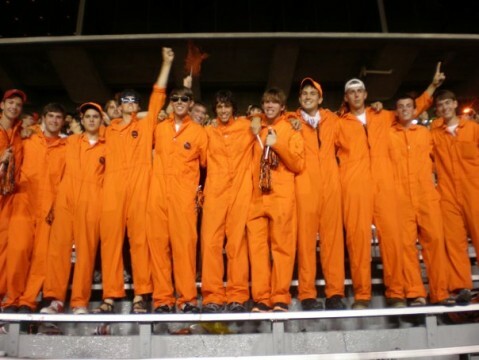 The Orange Jump Suit Guys from the College Kids Tailgate soak up the spirit at the West Virginia game. Auburn students Michael Nunnelly and Kevin Johnson walked away from Jordan-Hare Stadium after the West Virginia game happy, drenched with 3.75 inches of rain and a blood alcohol level of 0.00%. Their clothes were soaking wet. Their tailgate was bone dry. Nunnelly and Johnson, both juniors, don’t drink. 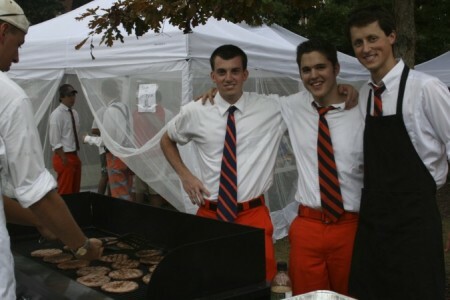 Neither do the now 14 other guys that help set up the College Kids Tailgate, a loosely but devotedly organized game day gathering that is beginning to draw attention on the Auburn University campus. But if not beer, than what? The group started in 2007, freshman year, with seven friends who lived in Lupton Hall where the group still sets up camp. Seven friends who were Christians. Seven friends who just, you know, didn’t drink. “We just decided to tailgate together and it just grew into this,” Nunnelly says. Since the start of the 2009 football season, over 1,000 people have stopped by the tents full of Cheerwine and orange cotton candy and the guys wearing the orange jumpsuits (all College Kids Tailgate trademarks). The group is unaffiliated with a specific church, denomination or campus ministry and isn’t even explicitly evangelistic. But connections have been made. Relationships developed. Lots of hamburgers grilled. “I just appreciate them hanging out together and providing a place where kids can come hang out and feel safe and enjoy the game,” says Johnson’s mother’s Tami, taking shelter from the first of the days many downpours underneath one of the tailgate’s tents before the West Virginia game. Tami and her husband Ken were both down from Birmingham for the day. From left to right: Auburn juniors Brandon Campbell, Kevin Johnson and Michael Nunnelly. That’s the idea, Nunnelly says. “Hopefully it’s making more of an impact than not just not having alcohol but by having people that are here developing relationships with Christians that are doing evangelism with their own lives,” he says. Nunnelly’s mother Lottie, who graduated from Auburn in 1982 and tailgated with her son prior to this year’s Mississippi State game, has seen just that firsthand. Also cool to see working? The bottle of Dale’s with a hole punched through the cap for seasoning en masse. Johnson gives it a shake. 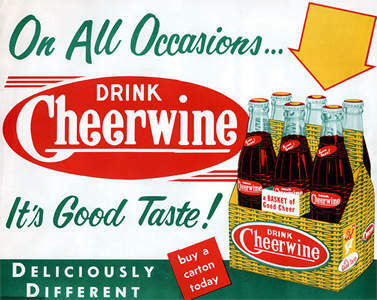 “That’s some Auburn engineering right there,” he says, knocking back a Cheerwine.